Ho Ho Ho and a ‘vocalicious’ welcome to the A1, festive blog. I am sad to say that this will be my final insight to the happy goings on at Soho’s friendliest studio as I will be leaving A1 VOX next Friday. I would like to take this opportunity to say a mahoosive thanks to you all for following the blog, and for being such great friends of A1 VOX. This will be the last blog of 2012, and my last ever (sniff, sniff), but A1 VOX is going nowhere so watch this space. We have the lovely Cass joining the team in the New Year, and boy wonders, Jamie and Tom, will be running the show until Christmas, so never fear people you are in good hands. So whilst temperatures drop and winter tightens its grip on Britain, A1 VOX’s Lucy Scott, (aka Petrie), has been at it again. 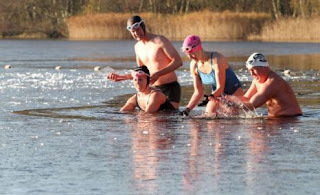 By ‘at it’ I mean bracing herself with fellow swimmers as they brake the ice over a frozen pond and take a morning dip – as you do!? If you happened to be in the Farnham, Surrey area last week you may have stumbled across the mad members of Lucy’s self made group the Frensham Aquatic Recreational Team. These crazy dudes brave sub-zero temperatures and wade out into the chilled waters of Frensham Great Pond in Surrey several times a week – whatever the weather. Mulled wine after a brisk winter walk makes me euphoric, so I think I will be sticking with that if it’s all the same to you Lucy. Brave, brave lady! Chris has been busy in the studio as we have just acquired Source Connect. Source Connect enables audio professionals to work with clients and talent from all over the world in real time. Studios can affordably record, collaborate, or monitor sessions anywhere in the globe using Windows and Mac. We also have our Skype line in place for anyone who prefers to link into a session that way. We recently had an Italian and an American client who both chose this method and were very happy with the end result. It means that there is no additional cost for calling in on a phone patch, the artist and client can see, as well as hear one another, and this creates a splendid interactive environment in which to work. A1 VOX – Technically Sound – we may be small but we are pride ourselves on keeping abreast of the latest ‘this and that’. Part One of the refurb has now been completed and I for one cannot wait to drop in at A1 VOX and see the continued jazzing up at 20 Old Compton Street. Plans are afoot for the second studio in 2013, so plenty of positive changes to A1 VOX come the New Year. It has been nice seeing some of my favourite guest voice artists in my final weeks at the studio. Jayne Sharpe has been in. She always brings a smile to my face…and often wet socks for us to dry (don’t ask)…..Redd Pepper always entertains with his deep voice, and diet advice, and I am glad that I got to hear him in action one more time before leaving. Being in this job you get to meet such a range of people and celebrity, and the day to day variation is phenomenal. I will never have a job like this again and will cherish all the memories of the last five years. Working with so many lovely people – many of them reading this blog right now – has been the best part of all. It is a truly lovely industry to work in and I have this blog to look back on whenever I feel A1 homesick. A big mention has to go to Charles for employing me in the first place and for being a great boss man and all round top bloke! I will miss my daily musings with both him and Chris, and of course all the shenanigans of the wonderful A1 VOX Team. So all I have left to say is cheerio to one and all – it has been an absolute BLAST……..DIVE!!!!!!!!! Sarah and all the team at A1 VOX.